Spring has finally sprung, which means that summer is just around the corner! We’ve got some amazing yoga holidays in Europe planned for summer 2017, and we’d love for you to join us on one of our unforgettable experiences. Choose from a relaxing holiday in characteristic Santorini, an adventurous trip to the mountainous French Alps, or a fun surfing getaway in Morocco! Read below to find out more about our yoga holidays in Europe 2017. Santorini is one of the most dramatic and breathtaking Greek islands – we love the whitewashed buildings with domed roofs overlooking the deep blue seas. The weather we experience on these holidays is truly rejuvenating and energising, along with the delicious authentic foods and heart-warming locals. Take part in invigorating twice daily yoga with our experienced teacher, explore the cobbled streets of Oia, and enjoy some of the exciting excursions we have to offer! Find out more about our Sunshine and Yoga Holidays in Santorini here. 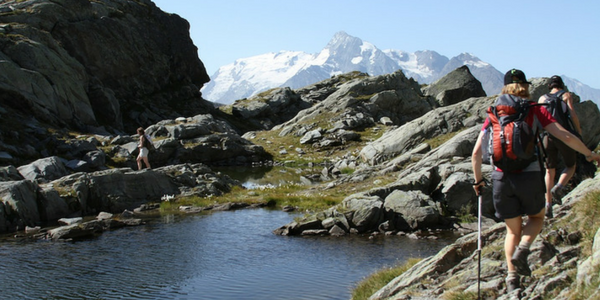 Our yoga holidays in the stunning French Alps are suited to the adventure seekers! Step outside your cosy chalet and the picturesque mountain trails are yours for the choosing. We offer daily hikes and other exciting excursions, including paragliding, white water rafting, mountain biking and wild swimming. If you fancy a more relaxing holiday, you can simply kick back and enjoy the majestic views – it’s all up to you. Find out more about our Activities and Yoga Holidays in the French Alps here. We know that Morocco isn’t exactly in Europe, but we’re so excited to be going back there that we couldn’t leave it out! Join us in our charming coastal villa, situated in Taghazout. We’ll be within walking distance from a beautiful beach with exciting daily surf sessions, 3 days of which are included in the price. We also have lots of other excursions on offer, including visits to local towns, horse riding, quad biking and more. Find out more about our Surfing and Yoga Holidays in Morocco here. We hope to see you on one of our holidays this summer! Want to retreat somewhere closer to home? Check out our calendar for our UK retreats.